WASHINGTON, DC -- After months of supporting separatist rebels to stir up trouble in eastern Ukraine, Russian President Vladimir Putin launched an overt (if relatively small-scale) invasion of eastern Ukraine sometime around August 21, sending in tanks, mobile artillery, and at least 1,000 troops. 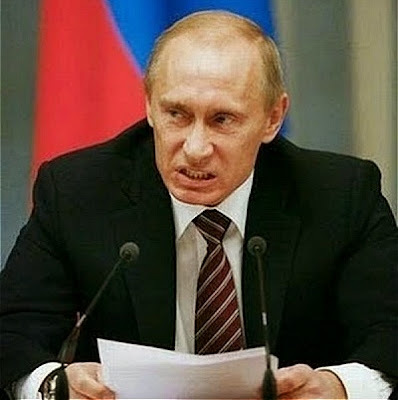 Putin, Czar of the "Evil Empire". This seems likely to come back to hurt Putin. The US and European countries were already imposing tough economic sanctions that had pushed the Russian economy on the edge of recession. It is all but certain that these countries will heighten sanctions — even German Chancellor Angela Merkel, normally hesitant to take such action, is suggesting as much — and damage the Russian economy further. So why is Putin doing it? In the short-term, Russia's goal appears to be bolstering the separatist rebels, who have been losing ground to Ukrainian military forces in the weeks since those rebels shot down Malaysian Airlines flight 17. But that's just a short-term goal. What is Putin's long-term aim? Four compelling theories exist, and while there is almost certainly some truth to all of them, it is the fourth — that Putin was pulled into invading by a crisis whose momentum is beyond his control — that is both the most plausible and the most frightening. This is the big fear: that Putin will do in eastern Ukraine what he did in Crimea in March, occupying the region militarily and then declaring it to be part of Russia. The evidence for this is two-fold. First, Putin wouldn't go to such great lengths to defend the rebels unless he really wanted them to hold that ground, and he's been hinting ominously for weeks that he may have to intervene to save eastern Ukrainians against the fascist Ukrainian army (this is a fiction, to be clear). Second, Russian forces just opened a second front far south of rebel-held territory, in the Ukrainian coastal area near the town of Novoazovsk. It looks like maybe they are trying to open a route from the rebel-held areas around Donetsk and Luhansk to the Black Sea — either to open supply lines or to make it a more viable slice of territory for annexation. The evidence against this is that, even for Putin, it would be just bananas crazy. No one wants to admit this, but as illegal and hugely offensive as Russia's annexation of Crimea was, the region has a large Russian ethnic population, a real degree of preexisting pro-Russia sentiment, and a bizarre history by which Russia handed it over to Ukraine during the Cold War. That is not to say that Russia's annexation of Crimea was at all acceptable — it was not — but world leaders were only willing to go so far to oppose it. Eastern Ukrainians are majority ethnic Ukrainian and appear far less okay with the idea of a hostile Russian invasion. There is no historical or demographic case for Donetsk as part of Russia, and world leaders have made very clear that they see Russian intervention there as far more offensive than the annexation of Crimea. It looked, in the first months of Putin's meddling in eastern Ukraine, like this was the aim: not to annex outright, but just to foment enough chaos there that Ukraine would be unable to fully break from Russia's orbit; that the low-level violence would be Moscow's gun to Ukraine's head. The Ukraine crisis began, after all, when Ukrainians protested en masse in autumn 2013 to push their government away from Russia and toward Europe, something that Putin fears. The evidence for this is that Putin has long pushed specific policy requests for the Ukrainian government as part of peace negotiations. The biggest is for Ukraine to adopt a federal system, which would allow province-level Ukrainian officials in more pro-Russia areas greater autonomy, and thus more room for Russian influence. The other bit of evidence is that Russia has used this strategy before to force its influence in former Soviet states. As Clinton-era Deputy Secretary of State Strobe Talbott tweeted, "Putin's strategy in Ukraine includes creating 'frozen conflicts' in east, much as Russia's done in Georgia, Moldova, and Azerbaijan." In this thinking, Putin is not invading to annex eastern Ukraine, but to protect the Russian-backed rebels that were in danger of being overrun by the Ukrainian military, so that he could keep his destabilizing influence there. Before Russia invaded, the Ukrainian military was looking awfully close to overrunning the rebels. Had that happened, Putin would have lost his ability to kick up trouble in eastern Ukraine — and thus lost a lot of leverage with the Ukrainian government. All Putin would have to show for his trouble would be a Russian economy devastated by economic sanctions. Maybe, then, this is Putin's last, desperate attempt to salvage something from the crisis by escalating it beyond what he knows the West can tolerate. The Ukrainian military is too weak to defend against Russia's, after all, and there's no way NATO will intervene and risk World War Three over the status of Luhansk. So perhaps Putin's ambition is to force Ukraine, the US, and Europe to accept some sort of peace deal that will grant Russia some face-saving concessions. This seems the most likely: that Putin did not choose to invade eastern Ukraine, so much as he was pulled into it by his own rhetoric, his own propaganda, and the degree to which he attached his political legitimacy to the crisis. This is the only way that the invasion really makes sense. Even if Russia's invasion of eastern Ukraine achieves the best possible outcome for Putin (maybe that means annexation, maybe it means Western and Ukrainian concessions), the long-term consequences will be so dire for Putin and Russia that it could not possibly be worthwhile. There is one place where the invasion does make rational sense: in the fantasy world that Putin has constructed in Kremlin propaganda and Russian state media. The official Russian narrative, which is disturbingly popular among Russians, is that Ukrainians are crying out for Russian liberation from the fascistic, American-run puppet regime in Kiev. The narrative also says that Russia is not just saving fellow Russian-speakers in Donetsk but is fulfilling its destiny as a great power, retaking the dignity that was lost with the 1991 collapse of the Soviet Union. The stakes are high for Putin personally. Since taking power in 2000, he has governed through an implicit deal with the Russian people, one that has proven generally popular: he delivers high economic growth, and Russians accept some curbs to political and individual rights. But then the economy began to slow, and in March 2012 a small but significant number of Russians protested against Putin's sham reelection, and he shifted strategy. Since then, Putin has based his legitimacy less on generating economy growth and more on stirring up old-style Russian nationalism. That appears to have been a big part of what drove his invasion of Crimea and his instigation of a rebellion in eastern Ukraine, which have been hugely popular in Russia. To juice that popularity, Russian state media has relentlessly and shamelessly fear-mongered about the supposed threats in Ukraine and praised great leader Vladimir Putin for standing up to the West and to the Ukrainian fascists there. Putin, unable to resist, repeatedly threatened a Russian humanitarian intervention. All of that paid of nicely for Putin, until it looked like his rebels were about to be expelled by the Ukrainian military, which would have been a disastrous humiliation for him and a repudiation of the nationalism on which he has increasingly based his legitimacy. It would have left him without the nationalism and certainly without an economy, which is nearing recession. Meanwhile, far-right nationalist voices within the Russian media and Putin's government have been urging him to escalate. So, no other way out, he did. If this is truly what is driving Putin, it means he may well be operating without a clear strategy or objective in mind. If one of the world's largest militaries is invading just to invade, then it is not at all clear when the tanks will stop rolling, or what sort of political compromise or concession would turn them back. Putin is not crazy, but he may have created a crisis with an internal momentum so great that it has broken beyond his control. That is a truly scary possibility. Quote: "«Мне кажется, что это очень хороший урок для нас всех, для того чтобы эту трагедию закончить как можно быстрее, причем мирным путем и путем переговоров, и об этом мы договаривались, кстати, с Петром Алексеевичем, и о том, чтобы никто и никогда не повторял таких ошибок, которая сейчас была совершена в Украине в ходе вооруженного захвата власти. Ведь это первопричина того, что сейчас происходит», — заявил Путин." It sounds like a plan as long as no Federalization is happen, which could lead to future annexation. More or all of funds, except set Central Tax, could be left in Eastern Ukraine with no political power that can lead to annexation. Full disarmament of rebels. NO dependence of Central Government on Russian interference, just normal, respectful and friendly relations. Population of Kuban region, Krivoy Rog territories has been russified by forceful forbidden of Ukrainian language to the population of both areas. Quote: "Премьер-министр Словакии Роберт Фицо назвал новые санкции Европейского Союза против России «бессмысленными и контрпродуктивными» и пригрозил наложить на них вето, сообщает Русская служба ВВС." "There is already 3 inches of water in swimming pool, unless we see the improvement of your diving skills, we are not give any more water in swimming pool." Quote: "The biggest is for Ukraine to adopt a federal system, which would allow province-level Ukrainian officials in more pro-Russia areas greater autonomy, and thus more room for Russian influence." Any type of Federalization of Eastern Ukraine will in the near future provide the basis to Russia to annex this territory. This is scenario from Catherin the Great annexation of Crimea from Turkey. The bazaar transfer of Crimea to Ukraine is not so bazaar. It was not simple transfer but, an exchange of territories. In exchange for Crimea Russia received Taganrog and surrounding areas, which is very fertile land, and was populated at the moment by 80% of Ukrainians same as Kuban region at its time. So, it was not free present, especially that Crimean farming was undeveloped at all and Taganrog territories was highly productive.